Was introduced to socialmeter today. Great fun in understanding the relative buzz around different sites. NYTimes scores 2.7 million; Wikipedia scores 100K; MIT OCW 25K; tOFP (drumroll please)…………190. One year ago today, I added Cluster Maps to the blog (see left margin). 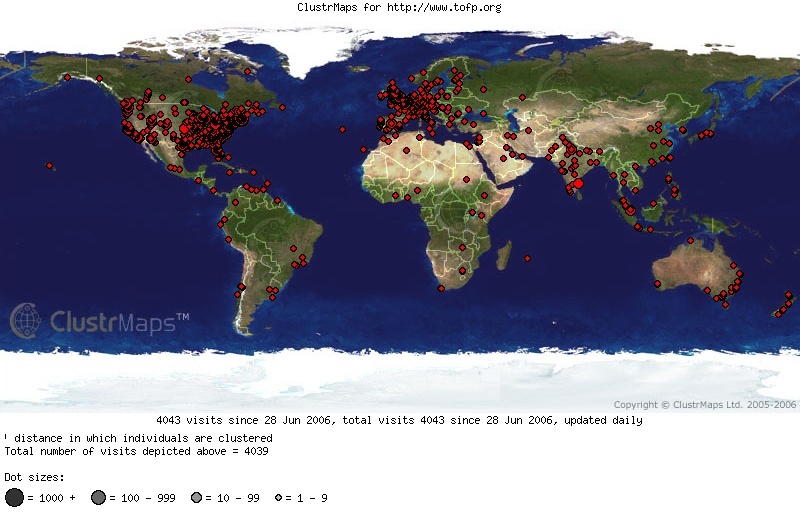 In the past year, Cluster Maps picked up 4,384 visits to the blog with a really exciting geographic spread. Some of the clusters are in places that make sense from my OCW Consortium contacts (Venezuela, Japan and Thailand, for instance), and it’s nice to see some visits from Sub-Saharan Africa as well. I’m including the expanded map in this post to show where visits have been recorded in more detail. Looks like I’m going to be doing some blogging over on Wide Open Education, a blog on the Online Education Database site. OEDb is a nice guide to online programs. WOE is an expansion on the site into the open education sphere–check it out. Before I went to the Global Social Benefit Incubator last July, I had finally finished rewriting the portion of the novel I had completed in graduate school ten (gulp) years ago. I had always had a little bit of superstitious about reaching this point, about what I’m not entirely sure, but since reaching that point in the novel, I set it aside to concentrate on work a little, and then Daniel was diagnosed. One family crisis later, I am finally at a place where I want to be working on the novel again. I’m not sure I have the time, really, but it’s sort of a sanity thing, so I’m carving out my morning train ride for it, and plan to go as long as I can. The numbers I report for tOFP each month are based on the Webalizer reports available from my web hosting service. A while back I signed up for a Google Analytics account, and got a message back that Google had suspended the issuance of new GA accounts because of demand. I only noticed recently (as I was playing with iGoogle) that I had in fact been granted an account and so instrumented my site pages with the required code. Google Analytics recorded a total of 391 visits last month (although I did not instrument the blog) which is way lower than what Webalizer reported. I’ve suspected for some time that Webalizer overcounted visits by a wide margin, ever since I implemented Cluster Maps on the blog. Cluster Maps has recorded more or less 4,000 blog visits in the past year, far fewer than the Webalizer reports would have me believe. Another good month for tOFP, with 11,848 visits and 65 copies of the tOFP [ Print ] version downloaded.